Longfellow Elementary School is one of four California finalists for the new national Green Ribbon Award, which recognizes schools for reducing environmental impact on their communities, promoting healthy school environments, and offering high-quality environmental education. Through Longfellow’s lunchtime and classroom recycling programs and other efforts, the school has diverted more than 100,000 pounds of trash from landfills over the past two years. The high rate of waste diversion was accomplished with the help of the City of Long Beach’s Environmental Services Bureau. In addition to recycling, Longfellow Green Team volunteers deliver unused cold foods and milk to Food Finders, a local food bank distributor, on a daily basis. Students participate in a Walk to School Wednesday program. Volunteers hold a monthly Uniform Swap, and the school has a new Junior Green Team of fourth and fifth graders. On top of its daily green activities, Longfellow, along with all Long Beach Unified School District schools, recently earned Energy Star Certification due to concerted efforts at the district level to conserve energy and save money. This, along with the district’s participation in SHAPE California, a nutrition education program, and the district’s Styrofoam recycling program, are ways in which all LBUSD schools are working toward healthier school environments. Longfellow teachers promote health and wellness through an expanded outdoor physical education program, and by taking students on various field trips that promote outdoor learning and environmental awareness. The school also has a science lab and a courtyard garden/outdoor science lab featuring California native plants, fruit trees, raised vegetable beds and an area for composting. “This recognition would not have been possible without the dedication of our wonderful Green Team parent volunteers, teachers, staff, and most especially, our students, who have embraced all the small daily changes that contribute both to a significant decrease in Longfellow’s impact on the environment and to a healthy school environment,” Longfellow Principal Laurie Murrin said. The U.S. Department of Education is expected to announce the national winners on Earth Day, April 22. The other California nominees are Environmental Charter High School in Lawndale, The Athenian School in Danville, and Grand View Elementary School in Manhattan Beach. 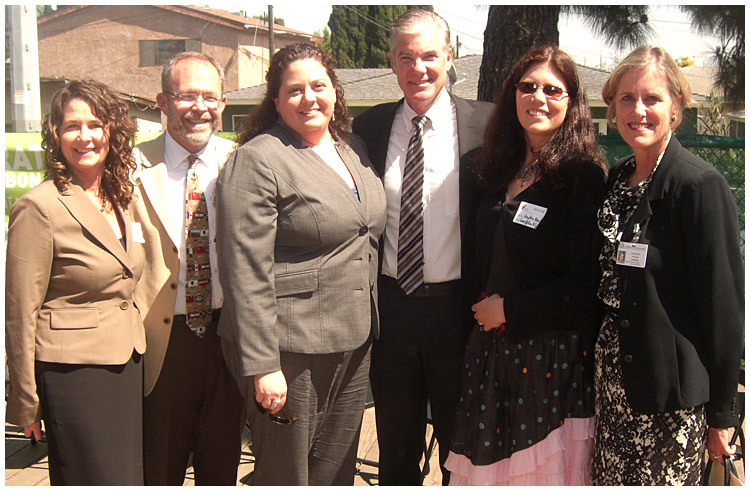 State Superintendent of Public Instruction Tom Torlakson announced the finalists recently at the Lawndale school. More than 50 schools applied statewide. "We are extremely proud of our schools," Torlakson said, "and are hopeful that all nominees will be awarded so they will be able to serve as models to emulate around the nation." GREEN TEAM—LBUSD Superintendent Chris Steinhauser and State Superintendent of Public Instruction Tom Torlakson, back row, congratulate Longfellow Green Team volunteers Kristi von der Linden, Megan Kerr, Heather Morrison and Longfellow Principal Laurie Murrin.